The Addressable FC410DIM provides the ability to connect and interface up to two zones of 24V d.c. 2-wire conventional detectors to the FireClass 500 Control Panel. The conventional detection circuit is powered from an external 24V d.c. supply and is reset by the FireClass 500 control panel. 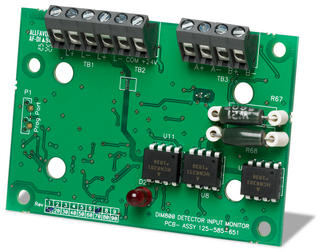 The FC410DIM monitors the status and wiring to the detectors and the external 24V d.c.